WW1 Reenactments Equipment : Great War Tommy WW1 Documents, Paperwork : 2 Canadian War Contingent Association slips. WW1 Reproductions and WW1 Reenactors Equipment / Kit - 2 Canadian War Contingent Association slips. 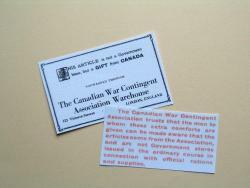 2 Canadian War Contingent Association slips. 2 different Canadian War Contingent Association slips to attach to items 'gifted' to Canadian troops rather than official Government rations and supplies.